We are up at 6:30 a.m. and are treated to a wonderful buffet breakfast. I have fried noodles, cereal, yogurt, and pork dumplings along with some fresh melons. 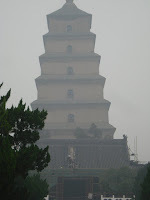 We check out of the hotel and head for the buses to take us to the Big Goose Pagoda. 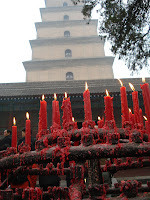 The B ig Goose Pagoda is a brick structure built to house Buddhist materials brought from India during the 7th century. 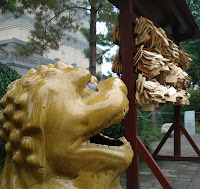 There is also a temple there with a golden Buddha inside. Worshippers come and light candles and incense to pray to the Buddha. In one of the gardens sits the “Happy Buddha.” It is the Buddha you most often see replicated in small statues. Our guide explains the long earlobes are a symbol of longevity and the big belly is for good fortune or prosperity. She invites us all to rub the belly for luck. As we travel throughout world, I am fascinated by how many different ways p eople have of offering up prayers. Here there is a "laundy" line strung between poles with prayers and wishes written on tablets and strung on the lines. Our next stop in Xian is called a “Fine Arts Center.” Translation: another shopping opportunity. 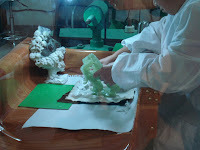 We are shown a workroom where 10-12 artists carve jade. A display in the wall exhibits the different types of jade that are mined. There is amber, lavender, and all shades of green from just a tint to a dark color almost like ebony. The most valuable color is apple green. Translucency increases value as well. Costume jade jewelry has the green color infused. 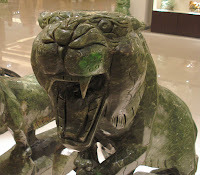 The showroom is huge and contains some rather large jade carvings. 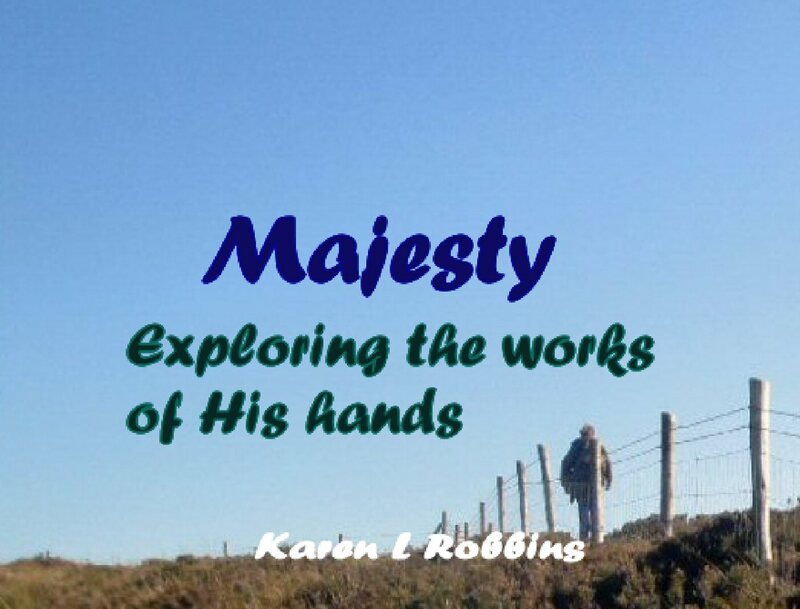 It is all very interesting to explore. We take advantage of our shopping opportunity and purchase a small sphere that contains 3 concentric spheres inside, each having holes that show the next sphere in size and each is free-moving within th e larger sphere. We are told it is a symbol of harmony. A jade turtle is added to our purchase as a Christmas gift for Bob’s mom. It is a symbol of longevity. We notice fog moving in as our group assembles in a restaurant at the Xian airport for lunch at noon. Lunch is a sampling of dishes on a lazy susan—rice, egg drop soup, sweet potato, beef, pork, and bean curd that resembles tofu and has absolutely no taste. At the gate we are seated and told our flight is delayed by the weather. The airline begins to hand out prepackaged lunches of rice and meat and some fruit. We are too stuffed to eat it and decline it as well as another meal offered later in the evening. I think I am getting tired of the smell of Chinese food. We sit for hours waiting. Our tour guide, Fred, and another group’s tour guide have a heated conversation with airline personnel. We learn another group was given our plane when the weather lifted. The two guides were able to get the airline to arrange for another plane to take our groups to Chonging but it is 9 p.m. before we finally board our plane. I am g rateful to be on the plane if for no other reason than the bathroom will certainly be better than the one at the Xian airport. 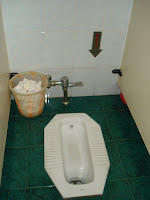 In China, there are mostly squat toilets for the ladies. Usually there is at least one “handicapped” stall with something that resembles a western toilet but most often without a seat. 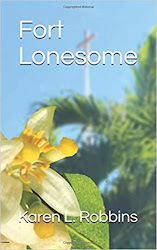 Many of us stood in line for the one handicapped stall—that is if you could hold your breath long enough. The rest room reeked of sewage (imagine six or seven outhouses that are full). To clean the stalls, the attendants would fill a bucket with water and toss the water across the floor. Thank goodness I brought Clorox disinfectant wipes and lots of Purell. I cannot imagine how exhausted our guides, Fred and Duan, must be trying to take care of 78 of us with all the problems they have run into. A bed sounds good to everyone at this point. Hope to nap on the plane.